For fans of The Textones, the arrival of a new album after a more than thirty-year wait may seem like nothing short of a miracle. There’s always been the feeling that after the release of their critically-acclaimed albums Midnight Mission (1984) and Cedar Creek (1987), The Textones, having helped define a new path forward for what became known as Americana music, had plenty of great songs still in them. Their new Blue Élan release, Old Stone Gang, confirms that suspicion in spades. 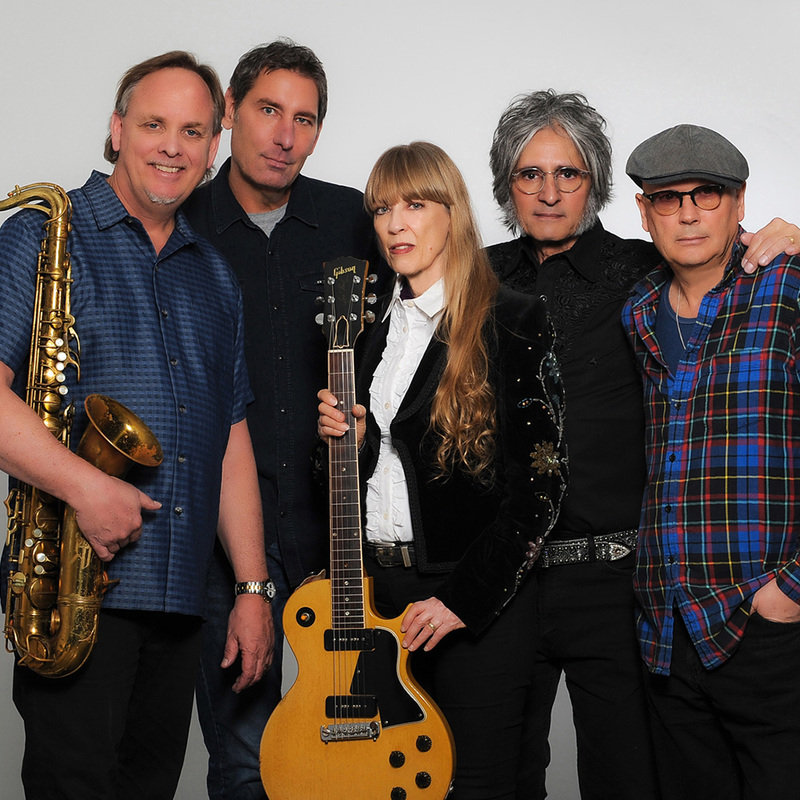 Bandleader Carla Olson has re-assembled her seminal group after several decades of her own highly-regarded releases, including albums with Byrds icon Gene Clark and Mick Taylor of the “mid-period” Rolling Stones – that includes YA-YAs, Sticky Fingers, Goats Head Soup, It’s Only RnR. (She’s also one of the few women to carve out a career in studio production, helming albums for a diverse clientele, including folksinger/actress Mare Winningham, jazz guitarist Phil Upchurch, rockin’ bluesman Jake Andrews and the former singer of sixties hitmakers Manfred Mann, Paul Jones — with Eric Clapton as special guest). There were a few attempts to reform The Textones over the years, but as band members got married, had kids, moved to other cities and found other employment, it didn’t become financially or logistically possible until 2012, when four tracks featured on the new album started to take shape in the recording studio with the Cedar Creek line-up all accounted for. The new album once again shows the tenacity of a band with a long history, one of considerable achievement in the face of some tough breaks. The original Textones formed in 1978 when Austin, Texas natives Carla Olson and Kathy Valentine – who’d already made some noise in their band The Violators – flipped a coin and Los Angeles beat New York as the target of their search for fame and fortune. Both were adept singers, songwriters and guitarists, with a knack for combining Merseybeat, punk and roots music. With David Provost on bass and drummer Markus Cuff, The Textones took the L.A. club scene by storm, eventually releasing a single on the seminal new wave I.R.S. label and a 3-song EP on the U.K. Chiswick imprint. After a few changes in personnel, a new Textones line-up eventually solidified under Carla’s leadership: former Dwight Twilley Band drummer and vocalist Phil Seymour, guitarist George Callins, keyboard/saxophone wiz Tom Jr. Morgan, and bassist Joe Read. All of them could write songs too. Landing a major-label deal, that line-up recorded the powerhouse Midnight Mission for A&M Records. Carla’s old friend Don Henley contributed vocal harmonies, ace slide guitarist Ry Cooder and the great blues pianist (and album co-producer) Barry Goldberg contributed some tasty licks, and even Bob Dylan got involved, paying Carla back for appearing in his “Sweetheart Like You” video by suggesting she record his unreleased song “Clean Cut Kid,” which The Textones absolutely nailed. MTV featured the video for Midnight Mission’s poignant title track, the band toured the world, and the disc landed on many “best of the year” lists, but The Textones didn’t achieve escape velocity for superstardom. Sadly, during a tour Phil Seymour was diagnosed with cancer and went back to his hometown in Oklahoma (he tragically died in 1993 at the age of forty-one). The follow-up Textones album Cedar Creek on the Enigma label, with Rick Hemmert in the drum seat, was just as strong, but the group was hit with more bad luck and never produced a third album until this year. “The Textones didn’t break up,” says Carla. “I got sick in December of 1987, when Cedar Creek was getting played on radio stations, and we were on tour. I knew I was losing weight dramatically, and having to drink gallons and gallons of water. When I went to the doctor I was diagnosed with type one diabetes mellitus. I had to stop everything I was doing, learn even more than I already knew about healthy eating, and learn how to take two kinds of insulin four times a day. It slowed me down considerably.” The Textones reluctantly scattered. Over the years, continuing demand from Textones fans spurred the release of the Through The Canyon and Back in Time compilations of studio outtakes and rarities, but at last the way to really celebrate The Textones’ legacy arrives with the intense and joyous new recordings on their Blue Élan return.